The three Dassies build houses of grass, sticks and stones. Then the Eagle comes calling. Help us by clicking a link and adding any item to your cart at Amazon within 24 hours, and we will earn a small referral commission. 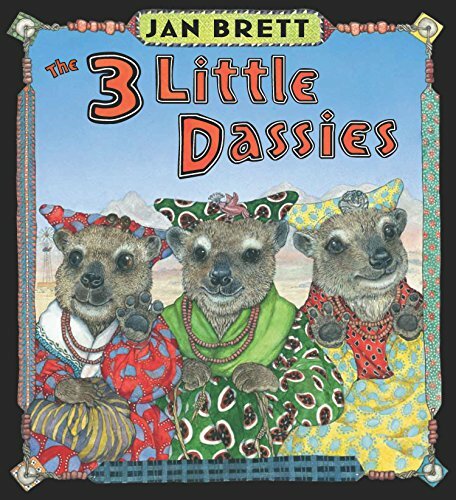 Below are search results for The 3 Little Dassies by Jan Brett at Amazon. You can visit Amazon to customize this search. Below are search results for The 3 Little Dassies at Alibris. You can visit Alibris to customize this search. 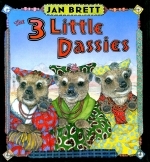 Below are search results for The 3 Little Dassies by Jan Brett at AbeBooks. You can visit AbeBooks to customize this search. Below are search results for The 3 Little Dassies audiobooks at iTunes. Browse iTunes to customize this search. Below are search results for The 3 Little Dassies ebooks at Apple Books. The Three Little Pigs with a twist! In the tradition of her bestseller The Three Snow Bears, Jan Brett finds inspiration for her version of a familiar story in Namibia, where red rock mountains and vivid blue skies are home to appealing little dassies and hungry eagles. Mimbi, Pimbi and Timbi hope to find "a place cooler, a place less crowded, a place safe from eagles!" to build their new homes. The handsomely dressed Agama Man watches from the borders as the eagle flies down to flap and clap until he blows a house down. But in a deliciously funny twist, that pesky eagle gets a fine comeuppance! Bold African patterns and prints fill the stunning borders, but it is the dassies in their bright, colorful dresses and hats that steal the show in this irresistible tale, perfect for reading aloud.